Here comes the age where a lot of changes happen in the teeth as well as the jaws. This blog will address the changes that happen in the jaws and also give knowledge about the second window for the exchange of milk teeth. 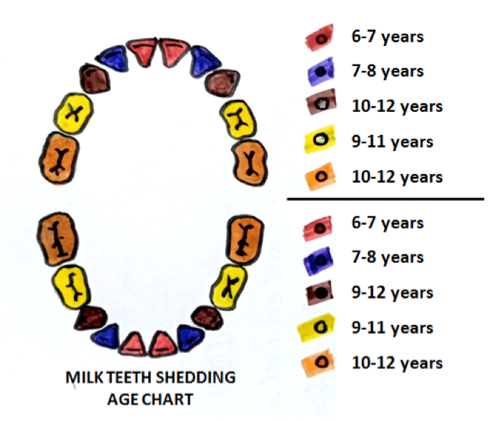 By the age of 9 years, generally, all the front milk teeth are replaced by the permanent teeth. At the age of 9-12years, kids start to complain about the wiggling back teeth. During this time, the child can also experience some discomfort and mild pain while eating. Generally, these teeth wiggle and fall off at different times ranging from 9-12yrs. Mirroring effect is noticed where both the right and left side teeth fall roughly at the same time. But if this discrepancy is more than 6 months, expert opinion has to be taken. After the milk teeth fall, it is expected that the permanent teeth erupt within 6 to 9 months. It is a slow process and parents need not to panic in the meanwhile. If it is delayed more, expert opinion is again mandatory. The following chart shows at what age the milk teeth exchange for their successors. Common concerns of parents when milk teeth are exchanged are already addressed in our previous blog about tooth care for children aged 3 to 6 years. Secondly, these milk teeth sometimes do not fall at the right time and these are called retained teeth. These teeth might block the permanent teeth from erupting and lead to malalignment. The other most frequent concern of any parent is whether the child requires future braces treatment. To understand this, utmost monitoring by the specialist is mandatory during this age. Along with the exchange of teeth, sagittal, horizontal and vertical growth of the jaws is seen in order to accommodate the larger sized permanent teeth and the muscle mass. 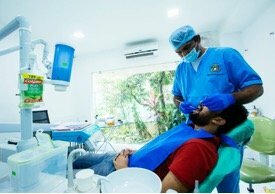 Excess or delayed growth can lead to changes in the shape of the face and during this time it is important to consult an orthodontist to understand if any intervention is required. This is high time for your kids to develop positive habits to take care of their tooth and developing these habits will help them throughout their life in maintaining a healthy lifestyle and dental care. Motivate them to develop a habit of brushing twice. Rinsing mouth after every meal. Keeping a constant check on their eating habits. By the end of 13 or 14 years, the child is ought to have a full set of permanent teeth (i.e.28) excluding the wisdom teeth which erupt at the age of 18-22 years. 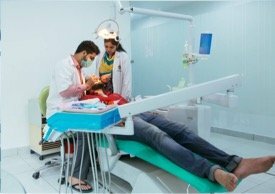 Utmost care and prevention have to be taken of the permanent teeth as they are the last set of teeth.